We are pleased and proud to be presenting a poster at the annual conference of the Assistive Technology Industry Association in Orlando, FL on February 2 from 3 – 5 pm. Staff and members from Voices of Hope for Aphasia will be at the conference to share our experience. The poster is titled, “A Life Participation Approach to Aphasia Technology“. It tells how we surveyed people with aphasia in our area. They told us about the topics they think are important for learning about using technology. One of the most important topics for people with aphasia is to learn how to use their smart phones, tablets, and other devices to record health information or to contact help in an emergency. 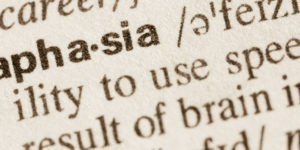 People with aphasia also want to know about tools that can help them connect to families and friends, like video chat. Although using technology to practice language skills is important, it was not the most important technology use as rated by people with aphasia in our Tampa Bay area. You can view or download our poster here.